Stone Javelins in order of increasing durability: Sedimentary, Metamorphic, Igneous Intrusive, Igneous Extrusive. Knapping out the Javelin Blade. Metal Javelins can only be made from tool metals. They can be cast in ceramic molds, or worked on a metal anvil. Bismuth Bronze, Black Bronze, Bronze, and Copper Javelins can be cast using a Vessel or a Ceramic Mold instead of working on an anvil. Place an empty or partially filled Javelin mold into the slot to fill it with metal from the vessel. It takes 100 units of metal to completely fill an empty Ceramic Mold. The text in the vessel's GUI will be updated to show the amount of metal remaining in the vessel. Put the ceramic Javelin mold in the second input slot and wait for the filled mold to finished. Javelin Heads can also be crafted by using ingots on an anvil with a hammer. This is the only option for higher tier metals that cannot be cast. The durability depends both on the metal used and the skill of the smith forging the tool. The Javelin, though capable of being used as a melee weapon, is more effectively used as a throwing spear. It is the only dedicated weapon which can be made without metal. 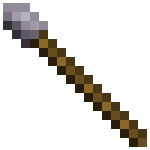 The Javelin can be drawn like a bow, making it a ranged weapon which inflicts Piercing Damage on players and mobs that it is used against. The javelin passes through enemies and can be recovered by picking the item up off of the ground or the block it was stuck into. The javelin only takes durability damage when it hits a player or a mob; if the javelin misses, no durability is lost. A javelin with low enough durability will break when hitting an entity. Removed stone swords, added Javelins. The javelin can be used in melee. Javelin thrown damage increased slightly. Javelins no longer have infinite uses in melee. Javelins are crafted with rocks instead of flint. Removed one stick from the Javelin recipe. Increased Javelin melee durability to 50 from 35. Reduced break chance of a javelin from 20% to 10%. Significantly reduced the force of a thrown javelin. Javelin thrown damage reduced by 45%. Javelin melee damage reduced by 27%. Stone javelins crafted with a knapped head, instead of simply a rock. Gave stone javelins a slight damage boost. Javelin skeletons don't all have the flame enchantment. Added the quiver to store javelins. Wither skeletons spawn in the overworld carrying javelins. They are the same as regular skeletons in that they have infinite ammo, and do not apply a wither effect. 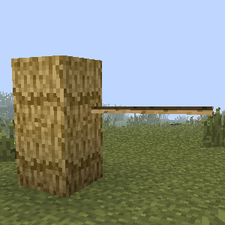 A javelin sticking out of some thatch blocks. This page was last modified on 8 November 2014, at 06:02.